With all the news about privacy, identity theft, and the role of access to vital records, have you ever considered that in 2012 most of us (at least here in the United States) have more privacy than our ancestors did? Most people believe that as a result of living in the digital age--an age ruled by the Internet and social media--there is less privacy than in the past. You might be surprised to find out that the reverse is actually true. And this lack of privacy has proven to be a boon to genealogists and family historians! There are many types of privacy and the concept of privacy itself differs among various cultures. For purposes of this post, let's focus on informational privacy, which is the right to keep certain information about one's activities and whereabouts private or from the prying eyes of others. Did our ancestors have the same expectation of privacy about these activities as we do today? Did they worry about the public knowing where they traveled, if they were in the hospital, or who they were visiting? Did it matter if a person lived in a small town or a large city? Or was privacy limited basically to one's own home--to one's castle--and anything and everything that occurred in public was considered public knowledge? Could Our Ancestors Live a Private Life? The truth is that our ancestors lived very public lives, even at home. My Huguenot ancestors arrived in America back in the late 1670s and constructed a stone house (still standing today) which was basically a large room situated around a hearth. Children were conceived in the same room where other family members, including eight or nine other children, would work, eat and sleep. Privacy was practically unheard of especially for those at the lower rungs of the societal ladder. Let's also look at how towns and cities themselves were settled. Groups of people lived in clusters not just for safety reasons, but also for reasons of commerce and network building. Our ancestors knew that interdependency and reliance on a "community" was part of building a physical infrastructure. And what about strangers or those new in town? In many places, there was a "need to know" in terms of who had arrived in town. Also, the fear of the "unknown" caused people to want to know who a person was, where they were from, and why they were visiting their town. While you ponder the concept of privacy as it pertained to our ancestors, understand that the need to keep information private was seen as a threat to society and to the social order. In general, the upper classes had more access to privacy. An example: their homes had multiple rooms with doors that sometimes locked as opposed to the homes of the lower classes that were one room dwellings. In fact it wasn't until the 19th century that the concept of a parlor or a special room to receive visitors and to keep them away from the private family space was developed. One only has to look to the early ancestors such as the Puritans to understand the then prevailing view of privacy: If you needed privacy, you had to be up to no good. Solitary time allowed a person to have their own independent thoughts, which, again, was a threat to the fabric of society. Luckily for today's genealogist, it seems that our ancestors were not as concerned about their own privacy. This is evident through a variety of record sets including newspapers, city and business directories, and more. Most small town papers, even to this day, have had or currently have columns listing the "goings on" of its town folk. These would include who visited whom, who had a party, who was invited to a party (or not invited if you could read between the lines), who was sick, who was traveling, who had started a business (or whose business went bust), etc. This was considered valuable news back then and, thankfully, for the modern day genealogist it is still valuable and exists in copies of these newspapers. 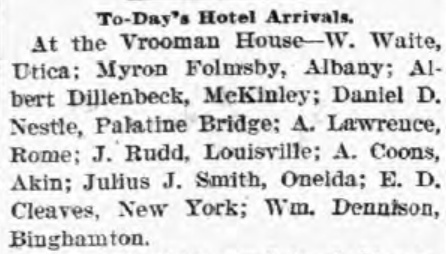 Many American newspapers in the late 19th century and early 20th century would publish a list of people who were expected to check in at hotels or were already staying at hotels. For major cities, such as New York, the listings were often limited to politicians and "society folk." Could you imagine having your neighbors read in the paper that you were in the hospital? It was fairly commonplace in small towns to have a weekly listing of who had been admitted to the hospital and who had been discharged. These listings were being published as late as the 1960s and 1970s in some locations. These listings did not list a reason for being in the hospital. (That might be lucky for our ancestors, but not so lucky for those of use trying to compile a medical history.) Hospital listings were meant to inform the community as to who had been ill or who might be up for a get-well visit. Really? Oh yes, there really were such ads, mostly placed by husbands who put the town on notice that not only had the wife left and deserted him, but also that he would not be responsible for any debts she incurred. 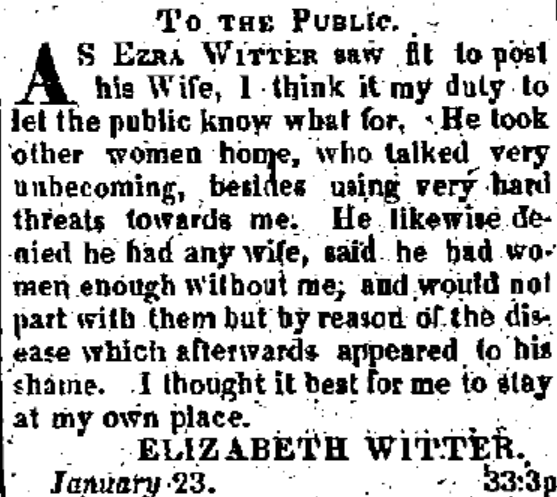 And sometimes, the absent wife would counter with her own ad and plead her case (see below). Oh no she didn't! Jerry Springer 19th century-style! Directories listing residents, addresses, and professions were not restricted to just the large cities. Some directories will even list if the person owned their home, rented it, or if they were a boarder. What we've covered in this article is literally just the tip of the iceberg in terms of the type of information published about people in the newspaper. You'll also find ship arrivals and passengers, lists of letters left at the post office, lists of those called to jury duty, and more. As we've entered the 21st century, it may appear that we are experiencing an erosion in personal privacy, but when we look at what our ancestors endured in terms of privacy, this much is true: Today we have more options to protect our privacy, even with the proliferation of social media and the Internet, which can cast out every detail of our lives to millions of people in an instant. 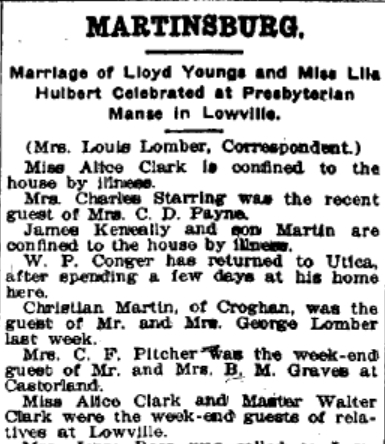 "Martinsburg," Lowville Journal Republican (Lowville, New York), 23 March 1922, Northern New York Historical Newspapers, accessed 12 September 2012, p. 7, col. 3. 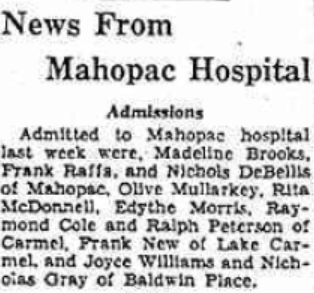 "News from Mahopac Hospital," The Putnam County Courier (Carmel, New York), 17 November 1960, Old Fulton Postcards, accessed 12 September 2012, p. 1, col. 5. 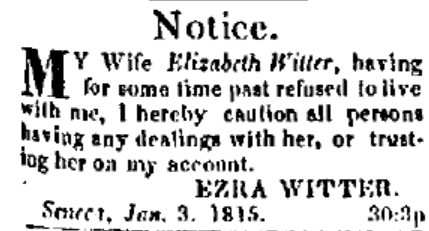 "Notice," Geneva Gazette (Geneva, New York), 15 January 1815, Old Fulton Postcards, accessed 12 September 2012, p. 1, col. 1. "To the Public," Geneva Gazette (Geneva, New York), 1 February 1815, Old Fulton Postcards, accessed 12 September 2012, p. 3, col. 4. "To-Day's Hotel Arrivals," Johnstown Daily Republican (Johnstown, New York), 13 April 1898, Old Fulton Postcards, accessed 12 September 2012, p. 7, col. 2.